Have you wondered why your students have a tendency to overreact emotionally? Have you ever wondered why some of them seem to think the world revolves around them? Have you ever wondered why, in spite of your and their parent’s best efforts, one of your high school students regularly leaves youth group in tears or angry and their friends? Adolescents are particularly prone to patterns of irrational thinking. Influenced by a myriad of sources, they often have an skewed perspective on themselves and the world they live in. Dr. David Elkind coined the term “Imaginary Audience” that many adolescents belive they are in front of every minute of every day. This type of thinking can be irrational and lead to all sorts of difficult behaviors. Albert Ellis (1977) described an ABC(DE) model of emotional disturbances that illustrates how beliefs influence emotions and how people become upset. 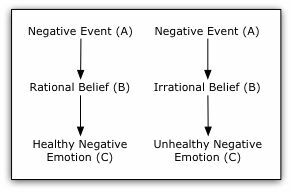 As shown below an individual’s beliefs (B) about an activating event (A) cause his or her emotional and behavioral consequences (C). This is contrasted with the commonly held belief (by adolescents) that emotions and behaviors are caused by the events. Disputation (D), or questioning and challenging irrational beliefs that young people might hold about themselves, others, events, and the world they live in will lead to a more constructive emotional and behavioral effects (E). Ellis and his colleagues have identified numerous irrational beliefs commonly held in our culture that appear to cause emotional disturbance. Some of the most frequently cited irrational beliefs can be found here. Conditions under which I live must get arranged so that I get practically everything I want comfortably, quickly, and easily, and get virtually nothing that I don’t want. We, as youth workers, are in a unique position where we can influence a students perspective and beliefs. It is with great fear and reverence that we should move forward into this position. We are in a position to shape their identity and the lens by which they interact with the world around them. We are not alone in this as parents, teachers, friends and other play this role as well, but we have the privilege of helping them navigate this stage of life. We should measure our words and be careful because we can either reinforce irrational beliefs (that shape their behaviors) or speak life and truth into their lives that help them understand who they are in Christ and the unique role they play in the Redemption Story.